JIUHYAN PRCEISION MACHINERY CO., LTD (Taiwan) - Toilet Paper/Kitchen Towel Rewinder, Paper Napkin Making Machine, Facial Tissue Making Machine. 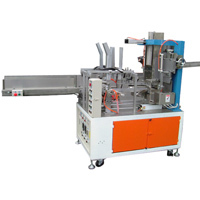 Regarding the design of Auto-packing machine for boxes, the machine can finish from the forming of the box, the filling of the printing of the date, folding the left side and the right side, sticking a hot melting adhesive to pilling-up. It's a kind of machine for box design with multi-functional and full-automation, which only needs small space and saves labor as well as sticks a hot melting adhesive by reducing the production cost so as to reach the safety packing. Meanwhile, this machine doesn't use an expensive hot melting adhesive with innovation, which is not only to save the volume of the glue but also reduce the malfunction degree to the minimum. It available for the manufacturers who make tissue cases. If you require for more detail information or request different specifications, please contact us!